A very use full and extreme Ball Splitter. Made from medium leather hide. 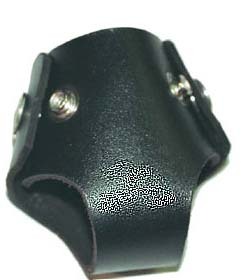 Extra strong ring press studs secure the harness in position. Made to last and can be used under normal clothing for day time wear. A steel ring can be added to the centre of the harness enabling it to be used as a testicle stretcher. See metal security items for rings. All customers should note that strictlyleather makes your item to order and does not hold stock items.